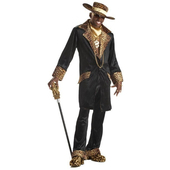 Size: X-Large: Chest size 46" - 48" Large: Chest size 42" - 44" Medium: Chest size 38" - 40"
The Mac Daddy Pimp Costume includes a black faux leather jacket with velvet collar, cuffs and faux pocket covers with zebra design. 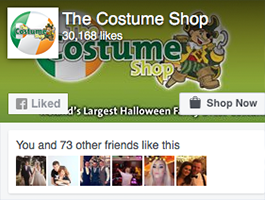 It has a single button closure at the front with a hem finish. 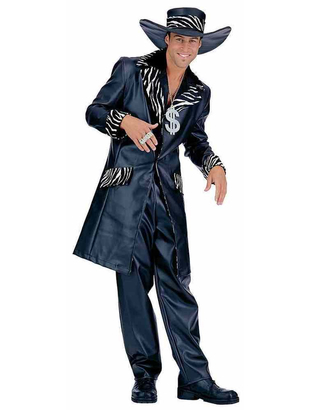 Costume also includes a pair of matching black faux leather trousers with a straight leg cut and leather look hat.